Wow, months fly by so quickly! It's been a while since I've blogged (again), but I have a pretty good reason. I spent most of June on an amazing trip to the Pacific Northwest (Portland, Seattle, Vancouver) and Hawaii. I ate a lot and saw some awesome things, and generally had an amazing time. Since I've been back it's been full steam ahead with work, Masters and Eating For Animals events. I am going to start blogging again. I still have so much of Japan to go, plus my most recent trip, plus my ever growing photo collection of recipes I've been making. So I am going to jump around between them all depending on my mood. My last few posts from Japan were more travel than food! In the meantime, here is some pizza! The day after I got back from the US was World Vegan Pizza Day. I didn't have time to organise any sort of pizza event, but the beauty of pizza is that you can celebrate just as easily at home. Hurrah! 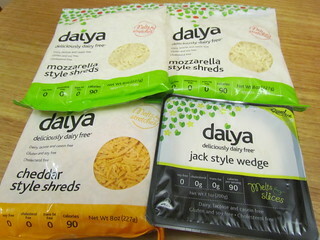 I was so excited to bring some Daiya home with me. Above is my haul. I bought it in Hawaii (our last stop before home), froze it and then packed it in a cool back and put it in checked luggage. It was fine. I bought home two packets of mozzarella, one of cheddar and a block of jack cheese. Sadly I couldn't find any of the new Swiss slices. 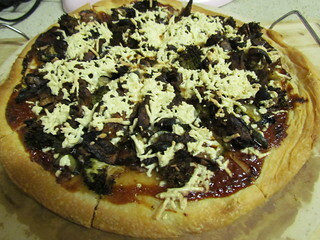 Pizza the first was barbecue, roasted vegetables (zucchini, onion and mushrooms) with Smoky Soy Curls (from Vegan Diner) and mozzarella Daiya. The Daiya melted and went all oozy. To be honest while I enjoy Daiya, the texture of it does vaguely creep me out. 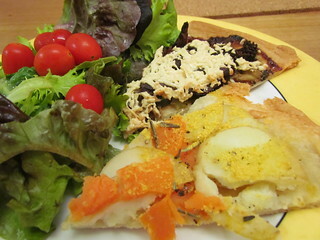 The second pizza was Daiya-free, but one of my favourites. 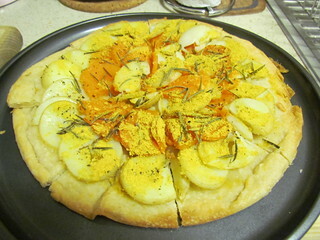 Olive oil and garlic with potato, sweet potato, rosemary and a dusting of nooch. An excellent Vegan Pizza Day indeed! The bases were just purchased bases from my local deli. They are yummy and vegan, and make for very quick pizza prep. 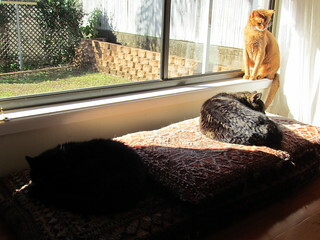 A rare photo of the three kitties sunning themselves. You can see Dim Sim a little bit in the shadows, then Possum on the cushion and Sahara on the window sill. We have been having such magical blue and warm winter days, the cats love spending time in the sun room sunning themselves!